Write a letter, send an e-mail or place a phone call to one or more of the following representatives and non-profit organizations. State what's on your mind. If you're expressing an opinion, use facts to back it up. And remember, stay calm and courteous, as this increases your chances of being heard. Please note that this list is for informational purposes only. Animal Planet does not necessarily endorse the organizations listed. * Sea Shepherd is an anti-whaling non-profit activist organization that uses non-violent, direct-action tactics to thwart whaling activity. * The Institute of Cetacean Research is a privately owned, non-profit institution that conducts scientific research on whales. Their legal status is authorized by Japan's Ministry of Agriculture, Forestry and Fisheries. * The United States of America is an anti-whaling nation. It stands opposed to a resumption of commercial whaling, but does allow for small-scale aboriginal whaling. * Japan is a pro-whaling nation currently engaged in a long-term scientific research program to assess the commercial viability of whale stocks. * Norway is a pro-whaling nation that engages in commercial whaling. Having filed an objection to the International Whaling Commission (IWC) commercial whaling moratorium, it is not bound by it. * Australia is an anti-whaling nation committed to whale protection. It has established the Australian Whale Sanctuary to protect all whales and dolphins found in its waters. * Iceland is a pro-whaling nation that resumed small-scale commercial whaling in 2006 following five years of research whaling. * Humane Society International is non-profit activist organization, part of whose mission is to mobilize the public and governments around the world to protect whales species from potential extinction. 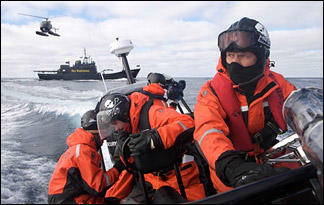 * Greenpeace is a non-profit activist organization, part of whose mission is to help put an end to commercial whaling.